Tally Expert Course - Become an Expert in Tally in 1 Month with me! Let me tell you a truth. Learning Tally is easy but becoming an Expert in Tally requires an effort. Tally is like a big forest and to become an expert in Tally, you need to put your efforts in the right direction, otherwise you will get lost in the forest like Tally. That’s where I come in. 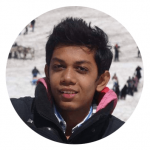 I am Rishit Shah and I’ve been teaching Tally since 2014. I have created a Full Tally Course called Tally Expert Course in which I will guide you through each and every step from the beginning till the end. At the end, you will become a Tally Expert. And, I am not joking at all. At the end, I’ll show how people feel about my teachings. After becoming a Tally Expert, you can apply for a job of an accountant or you can manage your own business effectively. 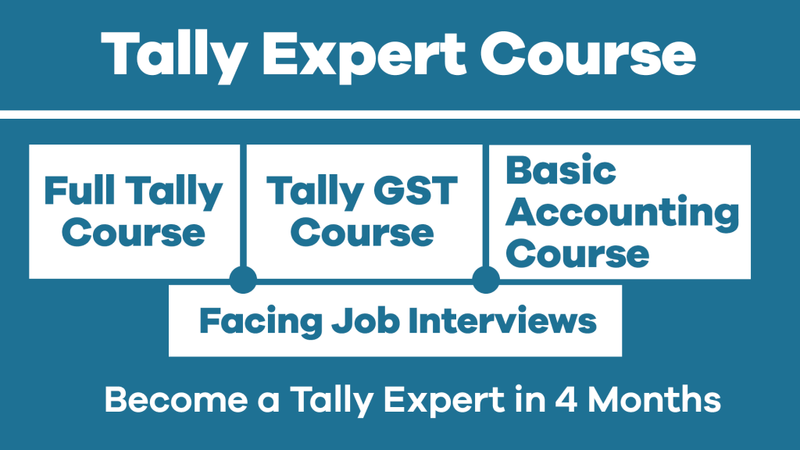 To become an expert in Tally, you need to know Accounting and Tally. By only knowing Tally, you will never become an expert. Tally helps you to do accounting in digital format. So, to operate Tally you need to know accounting as well. With GST, it is important for you to learn its basics to be able to operate Tally in the best way. 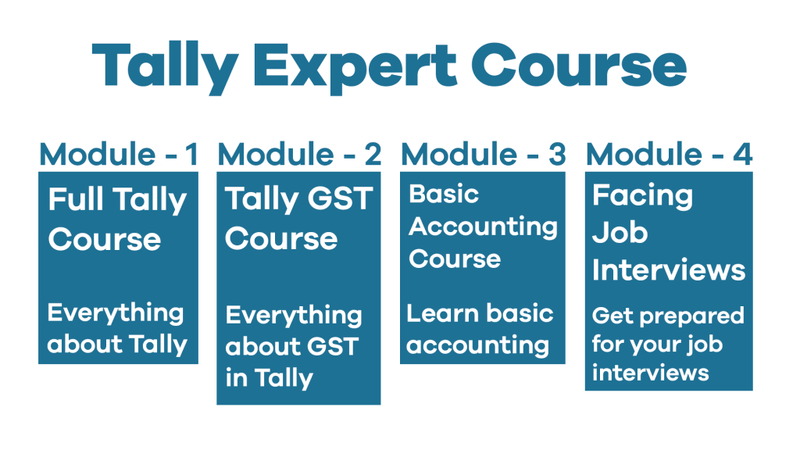 In this Tally Expert Course, you will learn Accounting, GST and Tally. Along with this, you will also learn how to face a job interview and how to prepare for that. This whole program is designed in such a way, that you will learn everything from basics to advanced along with practical examples and tests. And, not to forget, Tally Expert Course is fully updated with the latest GST amendments. I can understand that being a science student or a student from any non-commerce field why you want to learn Tally. So that you can find a job or you can manage your own accounts. But, don’t you worry. Tally Expert Course is designed in such a way that even if you don’t know anything about accounting, you will be able to go through the course smoothly. This entire course is focused from basics to advanced with a special focus on basics. Once your Accounting and Tally Basics are clear, you will be almost equal to a commerce student who wants to learn Tally. I am Rishit and a CA Finalist. I learned Tally when I was doing my CA internship from a 10 year experienced CA. I had a great opportunity to work under some of the best professional Chartered Accountants and learning Tally from them along the way. Along with Tally, I also learned the ins and outs of accounting and taxation as well. With this blend of knowledge, I started teaching Tally online on this website and soon, people started loving it. I know, that not everybody is able to learn Tally with a CA and that’s why I have created Tally Expert – A Fully Integrated Tally Course. Since 2014, the year I started teaching Tally, thousands of people have learnt Tally from me. Their knowledge of Tally is as clear as spring water. Tally is accounting in digital format. You cannot learn Tally without knowing Accounting. There are different types of accounting entries and there are different vouchers in Tally through which you can create different accounting entries. So, you need to know which kind of accounting entry is to be done for a particular transaction. For example, let’s say there is a transaction of Purchase of ₹10,000 with 18% GST. In this transaction, there are 3 parts. Accounting, Taxation and Tally. First is the identification of accounting entry which in this example is a Purchase Entry. Second is the application of taxation – GST in the entry. There are 3 types of GST and we have to see which one can be applied to this transaction. Third is to pass the entry in the correct way in Tally. Now, you clearly know how Accounting, Taxation and Tally are interconnected. In this Tally Expert Course, you will learn all the 3 concepts with a major focus on Tally. Tally Expert Course is divided into 17 chapters and 121 videos. Every chapter has practical test relating to that chapter. You will go through chapter by chapter from the beginning till the end. You will have to watch 1 video daily which can be completed in maximum 15-20 minutes. As soon as the chapter ends, you will have to try the practical tests. Every week, I will be calling you to check your progress of the course and to solve all your difficulties and doubts. So, if you complete only 1 video a day which is 15-20 minutes daily, you will complete the full course in 120 days which is phenomenal. It is a simple 3 step process. After 4 months, you will be a Tally Expert. You will know Tally better than most of the people around. This is how you will learn Tally with my Tally Expert course. Don’t make a mistake, most of the people do! Most of the people start learning only Tally without any base of Accounting. That’s where they miss the most important part. If you know accounting, it is good but if you don’t know it, you should first know the basics of accounting in a very clear way to be a Tally Expert. I have taught Tally to thousands of people and most of their doubts are about accounting rather than Tally. In this Tally Expert course, I have put the foundation through basics of accounting. Once you know the basics of accounting, you will know Tally much better. Along with accounting, I have also explained essential concepts of GST which are useful in Tally. By this all round 3 tier approach which is Accounting, Taxation and Tally, you will learn Tally in the best way. t is just simply awesome and no one can explain Tally as Rishit has explained in the course. Will recommend to anyone who wants to learn Tally in its entirety. Every concept about Tally is explained in detail. The Course is good and I liked the approach and a way in which Rishit has explained everything about Tally in this course. After going through the course, I have increased my knowledge regarding GST filing in my company. I am able to create GST invoices and file GST returns with much more clarity with the help of this course. I liked the Tally Expert Course very much and the concepts are explained in a very simple manner in the course by Rishit. I would recommend this Course to anyone who wants to learn Tally. Although I am an Arts student, I have been able to learn Tally easily from this Course. I liked it very much and it is value for money. I highly recommend it to anyone. Tally course offered by TallySchool is easy in learning and a true value for money for anyone who wants to learn Tally in detail. Everything in this course is according to my needs and my all the problems regarding Tally are solved with the help of this course. What is the language of this Tally Expert Course? Entire Tally Expert Course is in simple English Language that we use in day to day life. How many total videos and practical tests are there in this course? There are a total of 121 videos and 17 practical tests in this course. How the course will be delivered? You can download the course instantly after successful payment and start learning. How much GB is the course? Entire Tally Expert Course including all the video files is of around 3GB. Make sure you have a good internet connection before you start downloading your course. What is the exact course pattern and duration? If you complete just 1 video daily, entire course will be completed in 120 days. There are total 121 videos and if you complete 1 video every day, you will complete the course in 120 days which is 4 months. So, the duration of the course is 4 months. What are the contents of the Tally Expert Course? I you have not already downloaded the List of Topics of Tally Expert Course, you can download it here.